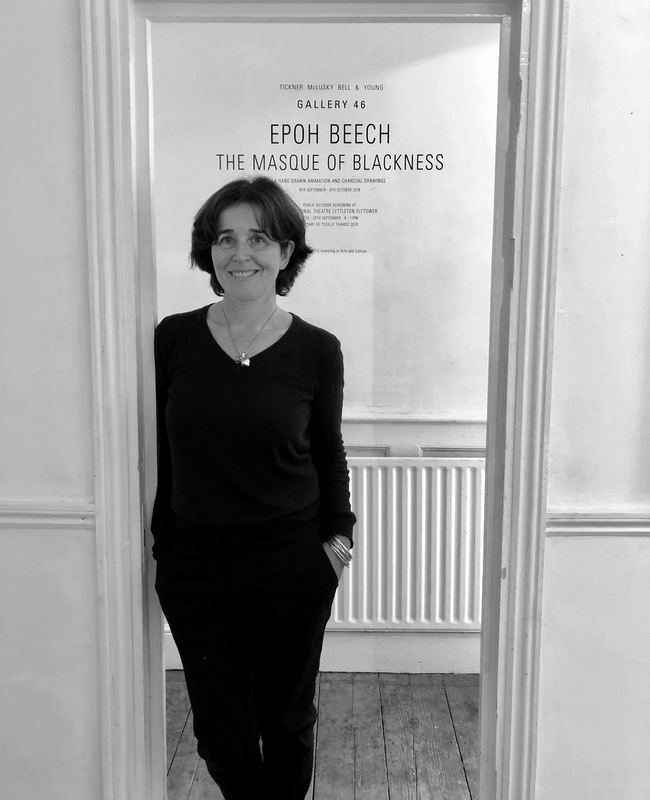 Artist Epoh Beech spoke to Curator Lee Sharrock about her exhibition ‘The Masque of Blackness’ at Gallery 46 London until 6 October. 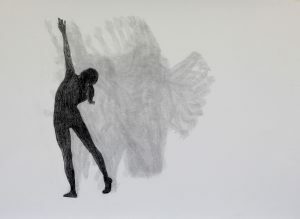 The exhibition supported by Londonewcastle features drawings and a captivating hand-drawn animated short film inspired by Joseph Conrad’s novella Heart of Darkness and Ben Jonson’s Jacobean play The Masque of Blackness, exploring the spirit of place to take you on a journey from West Africa to the Thames. 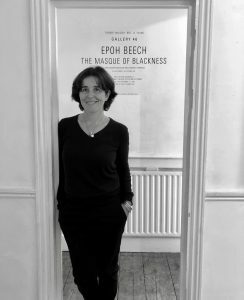 Lee Sharrock: The exhibition is titled ‘The Masque of Blackness’, after Ben Jonson’s 1605 play. It’s quite an obscure play, how did you come across it? Epoh Beech: My last animation was also based on a Jacobean Masque “The Marriage of the Thames and the Rhine” by Francis Beaumont 1613 about the two rivers and their symbolic meaning. This prompted me to research other Masques written at the same time. In “The Masque of Blackness” by Ben Jonson, the river Niger talks to the moon and the ocean. The vision of the River Niger speaking sparked my imagination, opening up a personal dialogue about the use of rivers, the imagination and their significance in Jacobean literature. LS: You will have a solo exhibition at Gallery 46 featuring drawings of different scale, preparatory sketches and an animated film. I’ve been to your studio and seen the volume of drawings and sketches you did over the past few years, which led to the animation. How long did the film take to create? EB: I started work on “the Masque of Blackness” in 2011. For the past 7 years, I have worked full time on the animation. 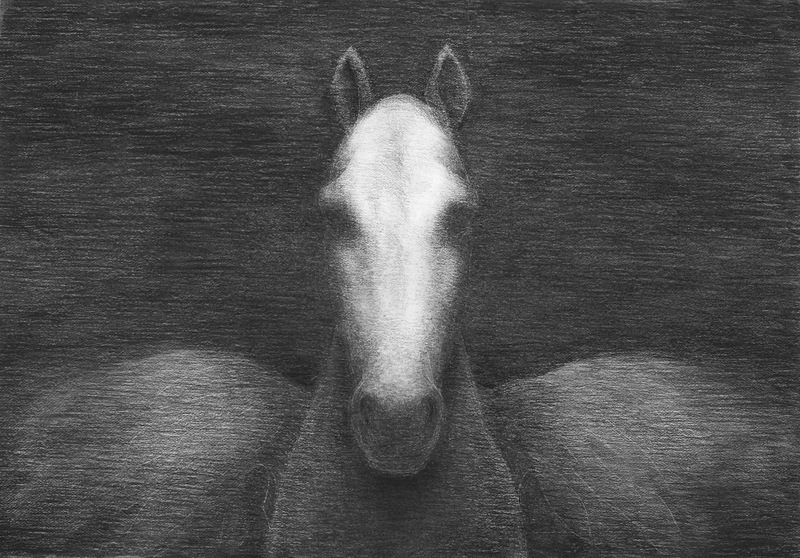 LS: For the exhibition you collaborated with several people, including a ballet dancer, composer, model maker, and a horse from the Royal Household Cavalry. How did all these collaborations come about, and what was their role in the making of the exhibition and animated film? EB: The collaborations all came at different stages, Esben Tjalve composed the score. Esben worked on my last animation. So he has been working on this film since the beginning and I have been sharing images with him over the 7 years,. Equally Matthew Thomas helped on my last animation and has worked several days over the 7 years on the film, with compositing the animation digitally, editing and adding sound effects. Julia Gillespie, a dancer from Rambert (at the time we worked together) modeled movement refrence for a figure in the animation. We worked together on the animation from 2014 – 2018. Doug Faulkner, also modeled movement reference for me. I filmed them both in my studio. I contacted the Household Cavalry Mounted Regiment in Hyde Park to see if they had a white / grey horse that I could use as a reference model. They were extremely helpful. I filmed Ptramigan in the stables at Hyde Park Barracks. In 2014, Duncan Mude, a prop maker on Star Wars, made two paper models for me, a carousel and a boat “The Nellie” he used the same paper I work on to draw the animation. He was recommended by a friend. 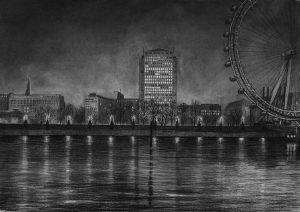 LS: The animated film will be projected onto the fly tower at the National Theatre, as part of the Totally Thames Festival. How did the collaboration with the festival come about? EB: There were two key moments really; the initial experience of seeing the side of the Rambert building on the South Bank and thinking what an amazing place to project the animation outside. The second, an inspiring exhibition called Floating Dreams by Ik-Joong Kang, which was part of Totally Thames 2016. As my work is related to rivers, especially the Thames, I thought the Totally Thames / Thames Festival Trust might be interested in my project. In December 2016, I contacted them. We decided that the National Theatre Flytower would be the perfect place to project the animation. When the project received funding from Londonewcastle it all became possible. LS: Your solo exhibition is at Gallery 46 in Whitechapel and supported by Londonewcastle. How did you come across the gallery and Londonewcastle? EB: I first encountered Londonewcastle in 2010 when I held an exhibition in Redchurch street, Shoreditch. They had a gallery project space there. They opened a new gallery in Whitechapel, Gallery 46 in 2016 and I sent them a proposal for my project. 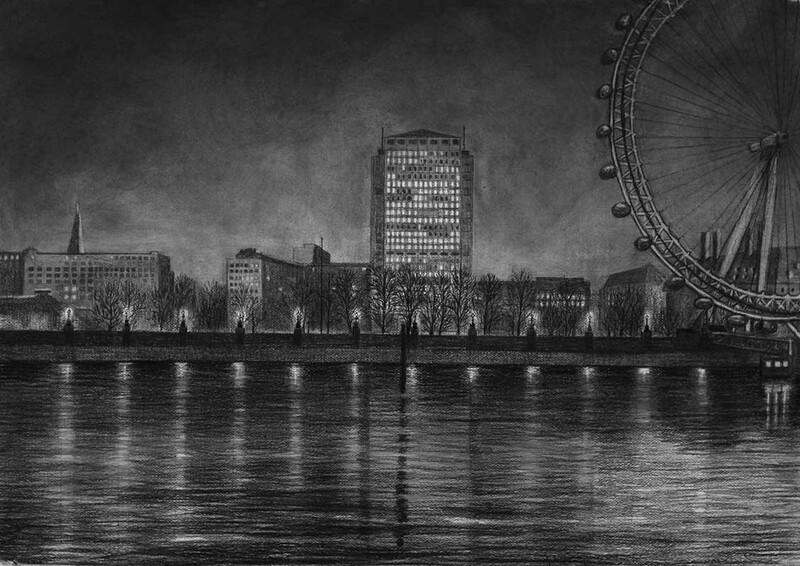 They agreed to give me a show Gallery 46 at the same time as Totally Thames 2018, September 6th – October 6th. Londonewcastle have been incredibly supportive and I am very grateful to them. LS: You say that “In this work I explore the connection between the landscape, the imagination and literature and between still and moving images, projected light/stroboscopic light, natural light, mythical symbolism and music, to see how, when all these elements are woven together they can help to develop a finer understanding of the image and thus may take the viewer more deeply into their own imaginations.” How did you translate the drawings and flip books into an animation? EB: I explore the connection between landscape and imagination by walking next to rivers and keeping multiple sketchbooks. I find that by returning to the same place over many years the images stay with me only becoming clearer. Then I animate them. I like seeing the images projected and the flickering light on the paper or wall. I’m also interested in the relationship between a still image and a moving image, especially when viewed next to each other. In a moving image time is located in the image itself and in a still image the view has control of time. Both very different experiences. LS: Joseph Conrad’s ‘Heart of Darkness’ was also an influence on the exhibition. Can you explain how the characters in your animation relate to Conrad’s Novella? LS: An exhibition of Nigerian art at the British Museum was a trigger for the initial research that led to this exhibition. What was the work that inspired you in particular? EB: I found the exhibition, The Kingdom of Ife, incredibly moving and beautiful. I felt a deep connection to the images. Yoruba mythology is very rich and the bronze/terracotta sculptures extremely fine. In the exhibition there was a terracotta crocodile, which represents a spirit of two worlds, like a psychopomp (someone who can travel between the world of the living and the world of the dead in the imagination) because it can live on land and in water. I thought this was similar to the grey seal, Hermes, in my animations. 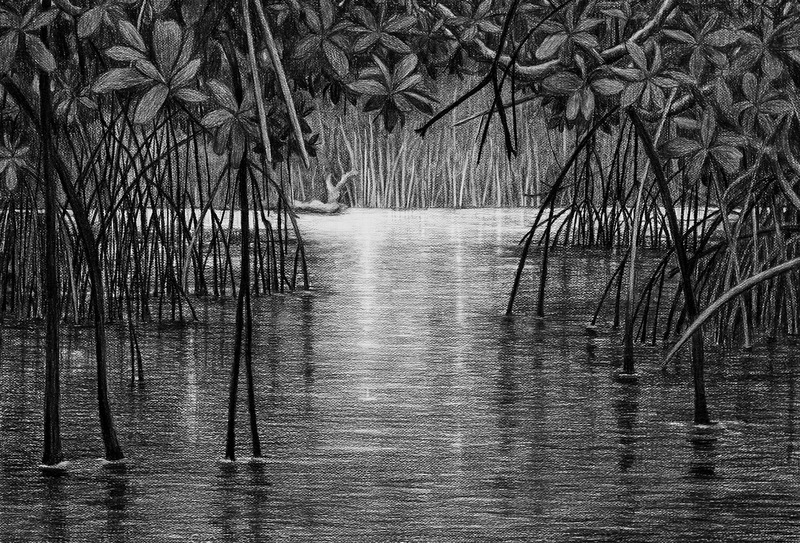 LS: You spent time in West Africa and Germany on field trips making ‘plein air’ studies of the rivers and mangroves. How long did you spend on these field trips, and what sort of process did you use for the drawings outside the studio? EB: I have traveled to the Rhine many times over the past 10 years. I’ve walked form the source in Andermatt ,Swtizerland to estuary in the Netherlands. I spent two weeks in a watch tower on the Dutch / German border, as part of a residency called Kunst Telpost – Millingen aan de Rijn Netherlands. 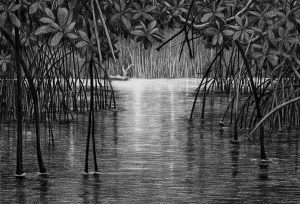 In January 2014, I spent three weeks in Ghana traveling the rivers Volta and Ankobra to draw mangrove swamps. I kept very detailed sketchbooks, and drew from both memory and form life. LS: Any plans to show the animated film at festivals or cinema? EB: Yes, I really love the idea of the animation being accessible to as wider an audience as possible. I will certainly enter the animation into international film festivals. In May 2019 the animation and drawings will be shown at Projektraum-Bahnhof25 in Kleve by the Rhine in Northern Germany, as part of a larger arts festival. At some point I hope “The Masque of Blackness” can be projected in the Niger Delta, in Nigeria, maybe onto a large building in Port Harcourt; that would really mean a lot to me. This entry was posted in INTERVIEWS and tagged Epoh Beech. Bookmark the permalink.